First invented in the 17th century by Dutch scientist Antonie Philips van Leeuwenhoek, the optical microscope is the traditional form of microscopy, and is still in use today. Sometimes known as a light microscope, it uses a series of precision lenses to magnify images of small samples with visible light. Therefore, optical microscopy is a technique employed to closely view a sample through the magnification of a lens with visible light. Even then, it seemed that van Leeuwenhoek had reached the so-called diffraction limit which is a theoretical boundary beyond adjacent that points cannot be distinguished under an optical microscope. This limit is determined in part by the wavelength of the light being used. According to the theory, the maximum size of the object you can image using a conventional microscope is half that wavelength. Anything smaller is impossible to bring into sharp focus. Now, by making a smart refinement to that technique, researchers at TU Delft have pushed its boundaries even further. Where previously objects measuring up to 10-20 nanometers could be observed, their method makes it possible to focus on structures of as tiny as 3 nanometers across. 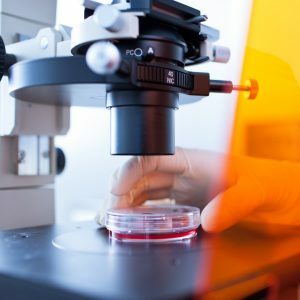 Optical microscopy is commonly used in many research areas including microbiology, microelectronics, nanophysics, biotechnology and pharmaceutical research. It can also be useful to view biological samples for medical diagnoses, known as histopathology. According to the researchers, their technique – which is already achieving resolutions at the three-nanometer level – should eventually make it possible to view structures measuring just one nanometer. At Universe Optics, we are committed to staying on top of new and developing applications. We take pride in working closely with your designers to ensure that the precision lens required for an optical microscope is of the highest quality.